If you know me, you know that I like to pretend my life is a movie. Whenever I get the chance, I employ some filmic device to the real world. For example, every so often I burst into song and expect everyone to know the words (and the dance moves). Or – and this is much more difficult to pull off – I stage a montage (usually involving training for a marathon, laughing in slow motion, and trying on floppy hats). One of the easiest movie tricks to execute in real life is the double take. Double takes can be emphatic (stopping in your tracks to get a better look at something) or subtle (a mere double glance, often confused for an aggressive wink). Wandering around the Saturday farmers market, I was thrilled to find myself in a situation in which a double take was entirely warranted. I had just purchased some delicious avocadoes from Ellwood Farm in Winchester Canyon and was fantasizing about the guacamole I would make with them. That’s when I did the double take. What… what were those things?! Arranged on the table of the Foley Farm stand were a cluster of some of the strangest looking things I’ve ever seen at a farmers market (and that’s including a dreadlocked woman playing the didgeridoo). After a particularly dramatic double take, I inquired about these bizarre things. The man working at the stand was named James, and he told me that they were a type of fruit called cherimoyas. 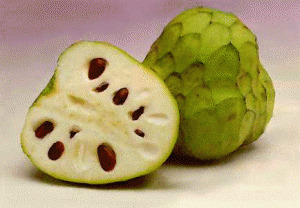 Cherimoya trees are evergreens native to South America; in the United States, they only grow in Southern California coastal areas and Southern Florida. Their crazy-looking fruit is sweet, but less acidic than other sweet fruits. James offered me a sample. It tasted like a combination of a banana and a pineapple, with the texture of a kiwi. Obviously, I bought one. I ate it in the simplest way: I simply cut it in half and scooped out the inside with a spoon. Cherimoyas are all over farmers markets in Southern California right now, so why not do a double take? Or a triple take if you really can’t figure out what the heck it is? I love discovering new foods, and this bizarre-looking fruit is going to become a staple in my local summer snacking. Cue: montage of Meghan snacking on a cherimoya while sitting on the front porch, reading a book, playing golf, running through a sprinkler... you get the idea. I go to Purdue University where they use kale as a decoration at the dining courts. I asked if they had any fresh to eat and now I am known as the weird kale girl. No matter, whenever I go to the salad bar the nice ladies bring me fresh kale. People still continue to think it is either really bitter or seaweed. Morons. Same with quinoa. How can I spread awareness of these delicious delicacies?! Thanks for the knowledge. I've been seeing these in the grocery store (Ontario) and been curious but haven't taken the plunge. I like your desciprtion!